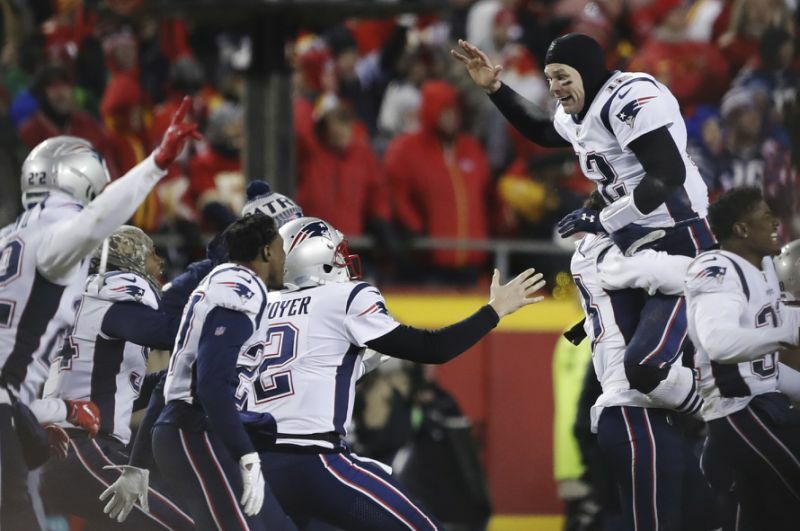 Last Sunday’s overtime thriller in Kansas City sent Tom Brady and Bill Belichick to their ninth Super Bowl together, and the way it all unfolded was reminiscent of some of the best games we’ve seen over the course of their 18-year dynasty. After starting the season 1-5, the 2015 Kansas City Chiefs won 10 in a row to finish 11-5 before destroying the Texans 30-0 in the Wild Card round. They were the hottest team in the NFL by a landslide. Then they came into Foxborough. The Pats jumped out to a 21-6 lead over the red-hot Chiefs by the third quarter, which is an insurmountable deficit at Gillette in January. The final result was a 27-20 win over Alex Smith and company. The ‘06 San Diego Chargers were a 14-2 juggernaut led by LaDainian Tomlinson, Philip Rivers, Antonio Gates, and a roided up Shawn Merriman. The Patriots finished 12-4, which was impressive considering that their lead receiver was Reche Caldwell, who ended getting cut before the next season. As they often do, the Pats capitalized on the opportunity by scoring and completing a two-point conversion to tie things up 21-21. The defense came up big, Brady drove them down the field again, and rookie kicker Stephen Gostkowski nailed the eventual game-winner before the Chargers’ missed a 54-yarder as time expired. Not many people gave the Patriots a chance against the 13-3 Steelers at Heinz Field with a trip to the Super Bowl on the line. Their 24 year-old quarterback was just lucky to be there. Leading 7-3 late in the second quarter, Brady was undercut by Lee Flowers and hobbled over to the sideline. A scary moment, but luckily the Patriots had the best backup QB in the NFL in Drew Bledsoe. With an opportunity for one more memorable performance as a Patriot, Drew didn’t disappoint. He managed the game perfectly, including a perfect pass to David Patten in the corner of the end zone to give the Pats a 14-3 lead just before halftime. The Patriots went on to win 24-17 and head to their third Super Bowl in franchise history. It was the Patriots’ fourth playoff game against the Ravens in six years, and they were 1-2 in the first three. The temperature was 19 degrees at kickoff with a wind chill of 8. As usual with Pats-Ravens match-ups, there was a lot of physicality and pushing and shoving after whistles. Baltimore jumped out to a 14-0 lead in the first, the Pats came back to tie it, and Brady threw a crucial pick that eventually resulted in a 21-14 Ravens lead at halftime. The Ravens scored again to go up 28-14 early in the third, but the Patriots responded right away to climb back within a touchdown. The 2017 Jaguars didn’t just end a 10-year playoff drought, they made it all the way to the Tom Brady Invitational (also known as the AFC Championship). Unfortunately Jalen Ramey got a little ahead of himself by guaranteeing a Super Bowl appearance before his team had to come into Foxborough. The coldest game Tom Brady has ever played in. The temperature at kickoff was 4 degrees with a wind-chill of negative 10. Of all the great games against the Ravens, this one will always stand out the most. Baltimore had seven Pro Bowlers in 2011. Terrell Suggs was the Defensive Player Of The Year. Ray Lewis and Ed Reed were nearing the end of their careers. Ray was hungry for a second ring and Reed was still looking his first. An instant classic. There’s no way you could process everything unless you re-watched the fourth quarter and overtime, which I’m sure you’ve all done by now. Patrick Mahomes was the greatest first-year quarterback of all-time. The Chiefs had only lost one game at Arrowhead. Tom Brady is too old. He can’t win on the road in the playoffs. Gronk isn’t the same. The defense is slow. This isn’t the Pats’ year. See you in the Super Bowl. For the ninth time. There’s only one game that could come ahead of this year’s AFC Championship. The one that started it all. The “Snow Bowl”, otherwise known as the “Tuck Rule Game”. The Pats trailed 13-3 with just over eight minutes left in regulation. A rare Tom Brady eight-yard rushing touchdown brought them within a field goal. The defense held Rich Gannon and the Raiders in check, setting the stage for one of the most controversial calls in NFL history. This was not an easy list to make. So many games to choose from and crucial plays to recall. But with all the success we’ve seen over the last 18 years it’s impossible to remember every important detail, so it’s a lot of fun to go back and reminisce. The best thing about lists like this is that they’re subjective to a certain extent. Even the biggest Patriots fans will disagree with each other over the order. Just keep in mind how lucky we are to even be having these debates.